Success in business depends on a lot of factors apart from taking the right decisions and having competent people on your payroll. It also depends on your choice of technology. Which one are you using? It is the most suitable one? Does it offer multiple benefits? Is your workforce happy working on it? Microsoft SharePoint includes the SharePoint Designer, SharePoint Foundation, SharePoint Online, SharePoint Server and SharePoint Workspace. 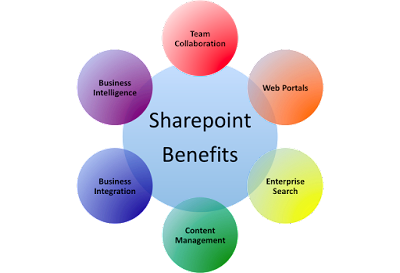 Given below are some benefits of the SharePoint Solution which should make you ponder seriously using it. 1. Microsoft Dynamics SharePoint accounts for a simple, reliable and familiar user experience. The SharePoint Solution comes tightly integrated with client desktop applications, web browsers and email in order to deliver a consistent user experience. Then there are some powerful functionalities for support, which facilitate product adoption. 2. Microsoft SP (its shorter form) makes everyday tasks a cakewalk. Its advanced workflows help initiate, track and report common business activities such as document review and approval, issue tracking and signature collection. All these can be successfully handled without the need to write code. 3. SP helps meet all kinds of regulatory requirements. Use it to specify security settings, storage and auditing policies and expiration actions for business records. You get to control ultra-sensitive business information this way and avoid any kind of litigation initiated against your organization. 4. The solution helps manage and revamp content. Its new document library templates simplify multi-lingual content management and also help link the original versions with translated stuff. 5. Accessing business data becomes simple. So does getting personalized views and interactions with business systems. SP’s Managed Document Repositories help store and organize documents in a centralized location. 6. SP helps empower employees with information. Its enterprise search functionalities blend business data with data related to documents, people and web pages to deliver convincing results. Then there are features such as duplicate collapsing, spelling correction and alerts that help improve the relevance of results. 7. Through the solution, businesses get a fine chance to speed up processes. It weeds out the need to code custom applications. It offers smart electronic forms to assimilate critical business information. There are built-in validation rules that help gather accurate data which can then be integrated into back-end systems. 8. Perhaps the finest thing about working on SP is that users get to work on a single, integrated platform. SP is built on open and scalable architecture. It offers comprehensive support to web services through XML ad SOAP (Simple Object Access Protocol) usage. Businesses get to manage their lists and documents through rich, open application programming interfaces and event handlers. These advantages offered by the Microsoft Dynamics SharePoint Solution will help you take your business to newer heights. You will have many chances at succeeding.